Not hard to make, at all. If your family and/or friends like tacos, burritos, Tex-Mex, etc., they will enjoy this. And I must say, as good as they were, they were even better the next day. Next time I make them, I will consider baking them ahead of time, then reheating in the oven or microwave to serve. The original recipe, as far as I can tell, was a prize winning recipe at Taste of Home. I’m not a member of the site, so couldn’t access the recipe. I found it on the Noble Pig site, where it had been adapted a bit. I adapted it a little more, so here’s my version. In a large saucepan, over medium heat, melt butter. Whisk in flour until smooth. Allow to cook for a minute or two to cook the flour. Whisk while gradually adding the water. Bring to a boil; cook and stir until thickened. Stir in chili powder, cumin, minced garlic, and dry onion. Bring to a boil. Reduce heat; simmer, uncovered, for 10 minutes. In a large skillet over medium heat, cook the beef and sausage [and onion, if using fresh] until meat is no longer pink; drain. 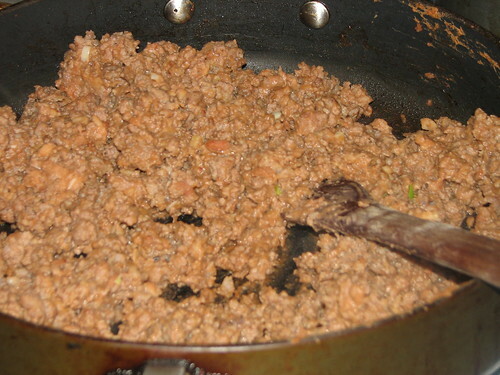 Stir in refried beans; heat through. You can make the filling with beef only, if you like, but I must say that the addition of sausage to the filling is much better than beef alone. 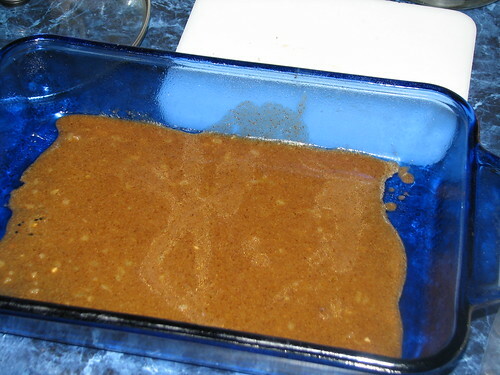 Spread 1/4 cup sauce in a greased 13 x 9 baking dish. 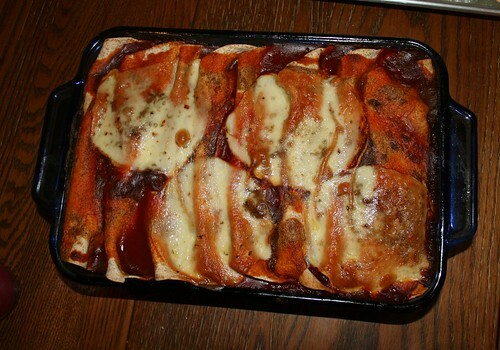 Spread a tablespoon of sauce on a tortilla; place 2/3 cup meat mixture down the center. 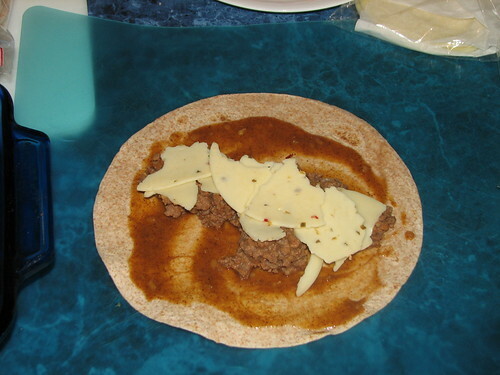 Top with a 1/4 cup cheese. 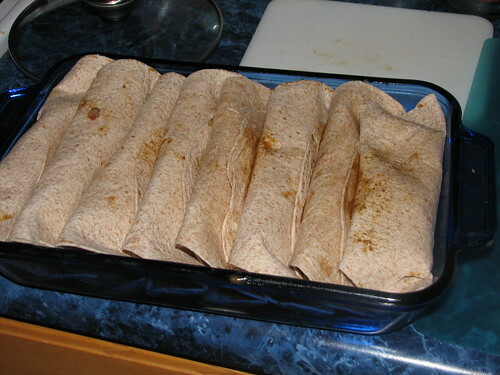 Roll tortilla and place seam side down in prepared dish. Repeat until eight tortillas are done. My pan isn’t quite 9×13, so they are rather crowded. 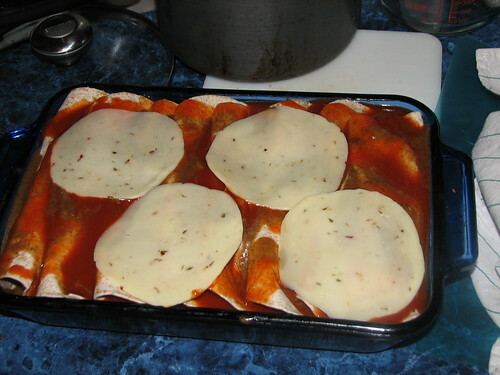 Pour remaining sauce over the top; sprinkle with remaining cheese. I used slices, as that’s what I had. Worked just fine. Bake, uncovered, at 350 degrees for 20 minutes or until bubbly and cheese is melted. After 20 minutes, I turned the oven off and left the tacoritos in the oven until DH came home from work…maybe 30 minutes. They were perfect. 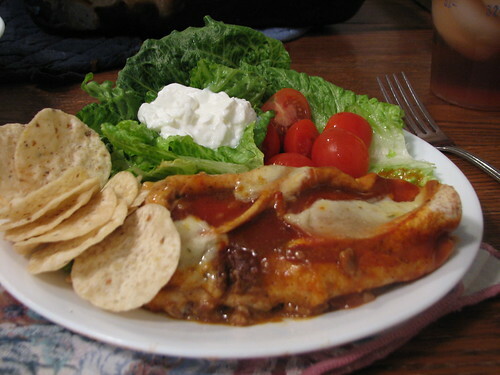 This entry was written by ~~Rhonda, posted on February 10, 2010 at 2:37 pm, filed under cooking, Recipes and tagged cooking, recipe, tacoritos. Bookmark the permalink. Follow any comments here with the RSS feed for this post. Post a comment or leave a trackback: Trackback URL. this dish looks great—must try!!! I’m going to have to try these – sounds delicious! I hope I can remember that I want to try this by the time we get home. It looks really good, but I don’t have much room in the camper for cooking casseroles, nor the space to store leftovers in the fridge. Didn’t add sausage nor refried beans as I dislike them, but added more lean ground meat and it turned out fabulous—again thanks for posting your recipes—helps those of us that get in a rut and cook the same things over and over! I forgot to buy the refried beans will they taste OK without them?